Just in time for the ISH 2017 in Frankfurt, fan manufacturer Nicotra Gebhardt added a fundamentally new type of fan to its range that focuses consistently on energy conservation and compact design. Behind this is the newly developed “MultiEvo” technology that has resulted in a range of directly driven hybrid centrifugal fans with multiple integrated guide vanes. Traditional housing fans have always been advantageous in respect of static pressure increase and energy efficiency. 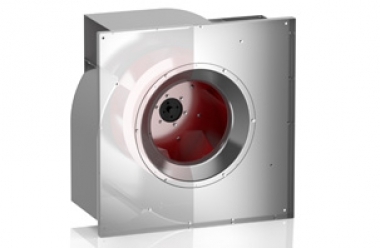 Speed-controlled, free-running fans are suited for compact design. Whilst most providers in the industry rely solely on optimizing individual components in the further development of their free-running fans, and thereby increasingly come up against physical limits, Nicotra Gebhardt looks at things holistically. “We examined the entire flow profile in detail and included it in the concept”, explains Anschütz. The multi-spiral technology – known as MultiEvo – combines the easy handling of free-running centrifugal fans with the effectiveness of traditional housing fans. 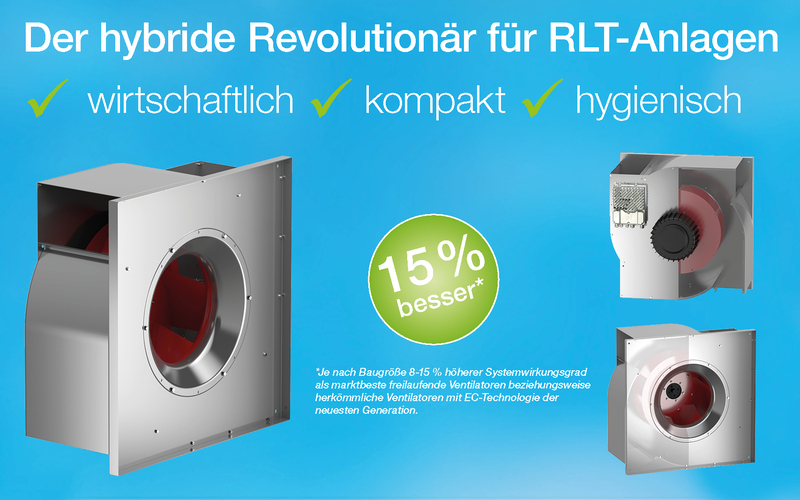 The new fan series is thus positioned as economical, compact and hygienic. The RQM MultiEvo is our response to the industry’s call for easy handling with best possible energy conservation in technical building equipment. Depending on the size, the RQM reaches 8 to 15% higher energy efficiency than the best, traditional free-running fans on the market. The measured absolute system efficiency levels reach values of up to 78% depending on the size (system = fan, motor, frequency converter). In many cases, the increase makes it possible to reach the optimal duty point of a system with a lower motor power rating. Besides more cost-effective operation, this results in additional savings in the initial investment. Nicotra Gebhardt delivers the RQM MultiEvo optimally parameterized. This ensures operational reliability and rapid integration. The RQM is by no means inferior to a free-running fan without a base frame. It can be used as a plug-and-play solution in any required mounting direction for floors, walls and ceilings. An unshielded power supply cable is required for the connection. Individual components can be replaced during maintenance. The cleanliness of clean air technology systems is also particularly important when it comes to regular inspections. The fan is easy to clean thanks to the easy accessibility of the guide vanes and inlet cone. The RQM MultiEvo is suitable for easy installation in new clean air technology systems as well as for modernizing existing systems in terms of operating costs. Other areas of application are the cooling of computer centers, in control cabinets, generators and heating units. And: the RQM MultiEvo is also particularly well-suited for creating multiple wall configurations with several fans arranged next to each other and one above the other as the airflows at the outlets are mutually supportive. At the start of production PM motors in accordance with IE5 efficiencies of up to 6.5 kW – free of rare earths – and integrated electronics are used. Impeller sizes are 355 to 710 mm, each reaching a maximum pressure increase of approx. 2,000 Pa. More impeller sizes and motor outputs of up to 22 kW will be available from mid-year. The MultiEvo technology describes a spiral-shaped multiple part, integrated guide vane. This aerodynamic optimization assists in obtaining the highest possible system efficiency. Significantly improved energy efficiency for the fan is reached due to the interplay of components that are best matched to each other consisting of impeller with hollow section true aerofoil blades, highly efficient motors and multiple spirals. As simple as it is ingenious, the new RQM MultiEvo combines the simplicity and compact design of free-running centrifugal fans with the effectiveness of traditional housing fans with respect to pressure and efficiency in a hybrid manner.